The first commercial dual shaft shear type shredders were offered in an electric drive arrangement and a hydraulic drive arrangement in the 1970’s. 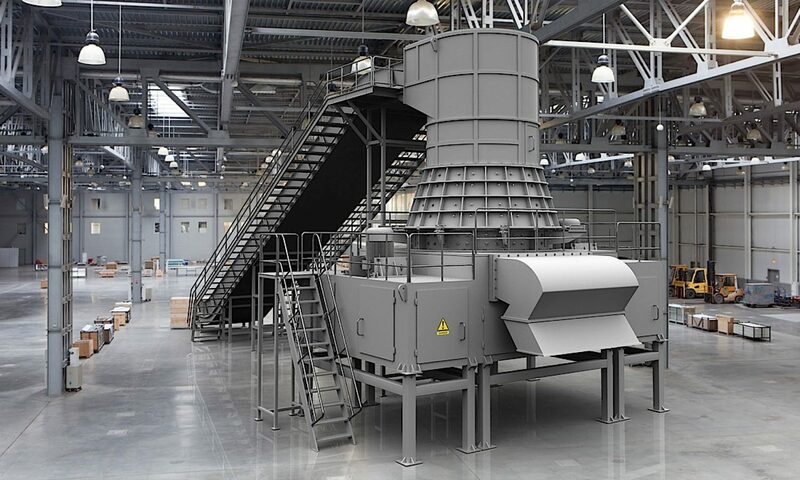 However, the larger versions of these machines, in the early days of the industry, in respect to dual shaft shear type shredders, most were sold into the recycling industry as Hydraulic driven shredders, and this was a standard configuration for about 10 years. The reason behind choosing a hydraulic system for shredders was only based on available experience and technology in regard to large shredders in this category. In 1972, PLC’s (Programable Logic Controllers) were only in their infancy. They were only being used, in a very limited fashion by car manufacturers and they were extremely expensive. The newly invented shear type shredder needed something that was powerful, cost effective, simple and, most importantly, was able to have an adjustable reverse function if overloaded. Since large motors had issues with overheating when exposed to constant reversals, and since motor starter electronics were not at a stage where this could be accomplished properly and economically, hydraulic drives were selected. This dominance changed in 1980 when electric driven shear type shredders could be applied in areas where a hydraulic driven shear type shredder had been the dominant machine. An oil tank, a hydraulic pump(s), valves, and a hydraulic drive motor(s). These hydraulic systems are built using a closed or open circuit. The oil from the tank is sucked or pushed under low pressure, to the hydraulic pumps, through a valve system and into the drive motor where it returns to the closed circuit or to the tank in an open circuit. It is easy to control the jammed shredder by using the reverse function of the three position four way valve built into the hydraulic system. These three position four way valves changed the direction of the flow to the hydraulic drive motor from one direction to another when the system reached a certain stall pressure. As an example, a slow speed shear type shredder that is hydraulically driven is set to reverse automatically as soon as the system pressure reaches the system relief valve pressure setting. This trip setting is about 200psi under the maximum system pressure. Hydraulic systems on industrial shredders are typically 3000psi, 6000psi and, on rare occasions, 10.000psi. The electric driven shredders are controlled with an amperage or rpm sensor so that when a jammed condition or stall condition occurs the electric motors are reversed in direction to clear the jam or stall. We have experience with both types of drives. Some shredder groups do not have experience with both types of drives and therefore have to offer you one selection. We offer one or the other or both selections. That’s important to note as some groups who only make one type of drive for a shredder will force their drive onto the client. We do not force anything on the client, we offer the proper selection and feel that this is the right way to help solve a clients problem. Let the experts at our group explain to you in proper form why we make our selection and why this may be the best choice for your group when challenged by the competition. We are not fighting hydraulic driven shredders vs electric driven shredders. We are just stating facts that are often misused by others who are supposed to be experts in their field. We challenge all experts with true facts. Basic facts on the electric driven shredder is that the hydraulic driven shredder in many applications is a very expensive drive package. The cost of an electric driven shredder drive is half the price of a hydraulic shredder drive. And that added cost is also reflected in the maintenance cost. Building shear shredders with heavier drive gears and drive gearboxes allowed the shear shredder to evolve in the electric driven side of the field with 400 and even up to 800 hp direct electric driven shredders by 1985, all pioneered by the Eidal Shredder group followed by others in the industry.